We were pleased to welcome Dr David Green, a senior lecturer at the Cavendish Laboratory in Cambridge. Dave gave us a very well-delivered combination of historical astronomy and modern research on supernova explosions. 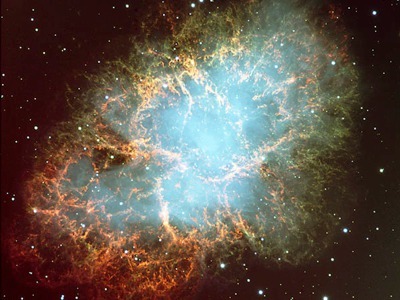 Specifically, he described the remnants of a number of supernova explosions that were recorded by earlier civilisations The most well known of these is the Crab nebula (M1) produced by a supernova which was observed by the Chinese in 1054 AD. Many supernovae have been detected outside our own galaxy (a recent one being the object visible to amateurs in M101), but it has been estimated that one should occur every 50 years or so inside our own. Many of the latter will not necessarily be visible through optical telescopes because of obscuring dust clouds, but their remnants will be detectable with radio telescopes. Dave described the way the ancient Chinese plotted the constellations, noting that they sometimes consisted of only a single star! Some of the supernovae must have been spectacular, since relating the ancient records to modern values of stellar magnitudes show that they could a magnitude of -6 or greater; this would cast a similar light to the moon. Current research focuses on radio observations of the structure of the supernova remnants, particularly since some show unusual distributions of X-ray and other high energy radiation. The Crab nebula itself contains a curiously shaped band of radiation that was only observable with advanced instrumentation. These puzzling findings are clearly providing astronomers in this field with plenty of theories to generate and explore with further observations.